At Luxury, You CAN Afford Awesome Outdoor Furniture! Why aren’t you making the most of your porch or patio? Get out, literally! Step outside with your guests confidently as you take in the summer sun and refreshing evening air with some tough but lovely new outdoor furniture from Luxury! With top brands to choose from such as Outdoor by Ashley (America’s No. 1 home furniture name) and Zuo, you’re sure to find the deck furniture and accessories you’ve always wanted but didn’t think you could afford, until now! Here are just a few of the possibilities. Just to warm up, get a carefully controlled tan, and/or to catch up on your poolside, everybody loves quality outdoor seating. Our top-selling outdoor chaise lounge is made of brushed aluminum for rust-free service, plus poly wood armrests to withstand the weather, as well as sturdy sling-weave construction. 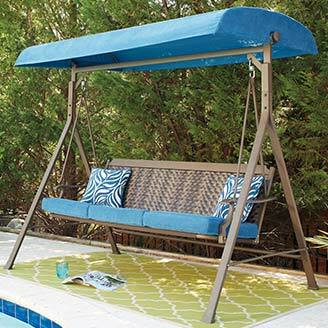 This is all in a unique curved design to add elegance to your outdoor relaxation. You need your outdoor dining furniture to be as tough as it is beautiful. After all, you’re not just buying for a season but for many years of drinks and dinners alfresco. Luxury Home Furniture has you and your budget in mind with its selections. For example, one of our favorite outdoor dining chairs boasts a smart, clean design in cool transparent high-performance Lexan, the same polycarbonate used for bulletproof glass! We dare say these outdoor dining chairs can take a Michigan thunderstorm or two. Better still, this high-grade material is UV resistant and comes with a 2-year commercial grade warranty against cracking! Outdoor fire pits are both great conversation pieces for summer entertaining and functional when the temperature dips in the fall. One of our most popular models is nearly 4 feet wide! 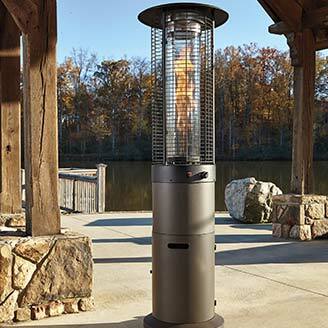 It features a 50K BTU stainless steel burner over firm, safe concrete fiber construction, and easy propane power (fuel sold separately from a gas dealer). You can ALWAYS count on Luxury Home Furniture to do outdoor furniture right and at a fair cost. Stop by our Oak Park, MI store at 20830 Coolidge Highway or any of our other greater Detroit locations soon!